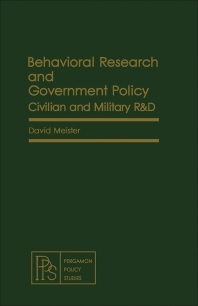 Behavioral Research and Government Policy: Civilian and Military R&D explains the influence that the government have on research and development in the field of behavioral science. The book explores the different aspects in conducting a research with the main focus on the sponsor of the study. The book is the second part of a journal series titled International Reviews in Aerosol Physics and Chemistry. The text offers significant understanding of the methods employed to develop a theory for thermophoretic and diffusiophoretic forces acting on spheres in the range from free molecules to continuum behavior. The book explores the mathematical solution for the kinetic model of the coagulation equation. Another topic of interest is the means to estimate size dispersal function for clouds of particles undergoing collision. The text can be a useful tool for practicing scientists and to graduate students in physics, meteorology, geophysics, physical chemistry, environmental science, medicine, chemical engineering, and aerospace engineering.